We’d love your help. Let us know what’s wrong with this preview of Chocolate Dipped Death by Sammi Carter. When poisoned bon-bons end the life of a town trouble-maker, candy shop owner Abby Shaw finds herself trapped in an extremely sticky situation. 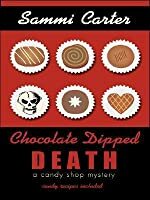 To ask other readers questions about Chocolate Dipped Death, please sign up. 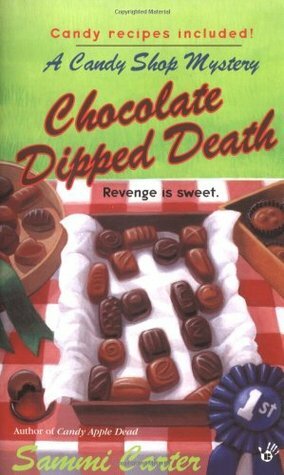 Nice second book to the series, this time with a murder occurring when Abby is holding the annual candy contest at Divinity. The victim was pretty easy to guess although I didn't get the culprit at all. I liked the recipes in the back and the French toast one sounds pretty good. What I loved about Abby is that she has a little of what readers love about Stephanie Plum, but she's not quite the Hot Mess, that Steph is. She has problems in her life; her family, trying to run a candy shop etc, dead bodies, but things don't blow up around her...well at least cars don't. The mystery involves the murder of the town bad girl/trouble maker who has returned for a candy making contest at Abby's shop, Divinity. To say Savannah is disliked is an understatement, so when Abby finds her dead, there are a lot of suspects. Savannah was pretty much a nasty thing to everyone in Paradise, Colorado, when she was in high school. Oh and these people know how to hold grudges too! That makes it harder to figure out "whodunit." I found Sammi's writing to be really great and I breezed through this book and now I'm longing to find the rest of the series, because I really enjoyed the characters and want to get to know them better. I also want to see how Abby's relationship with Jawarski develops over the next few books. There were a few things that didn't quite sit right with me at the end...uh, you can't reach the PD? I'm sure there's a thing called 911 in Colorado, even in a small town. There were a few other things too, but nothing detracted me from the story. Definitely a good afternoon read! 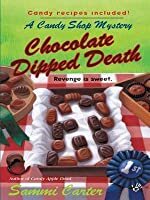 This is the second book in the Candy Shop Mystery series and a girl who no one liked when she was in school is back to compete in the candy competition at Divinity. Abby is worried her cousin will be blamed and when a box of chocolates from her store were found to have poisoned her she sets out to help the police find out who dun it. Another great story line and the mystery will keep you guessing. The relationships of Abby's family and friends are so real that you feel like you know them. A great This is the second book in the Candy Shop Mystery series and a girl who no one liked when she was in school is back to compete in the candy competition at Divinity. Abby is worried her cousin will be blamed and when a box of chocolates from her store were found to have poisoned her she sets out to help the police find out who dun it. The second in the candy shop mystery series. I didn't enjoy this book as much as some of the others in the series. The main character got whiny and irritating, and I wanted to sit her down with an ice pack and a cup of coffee and tell her to pull herself together. Overall however the mystery was good and had plenty of twists and turns although I did work out the murderer fairly early on. The other characters were believable and the story was of interest. The Annual Confectionary Competition has become a staple of winter in the small town of Paradise, Colorado. Abby Shaw is doing her best to carry on the tradition. As the new owner of the candy shop Divinity, it is her responsibility to run the weekend. Things are running okay until Savannah Horne arrives. Savannah hasn't been in town since high school, but memories are long in Paradise. When she was here, she made life miserable for everyone. Twenty years later, Abby thinks that Savannah might h The Annual Confectionary Competition has become a staple of winter in the small town of Paradise, Colorado. Abby Shaw is doing her best to carry on the tradition. As the new owner of the candy shop Divinity, it is her responsibility to run the weekend. Things are running okay until Savannah Horne arrives. Savannah hasn't been in town since high school, but memories are long in Paradise. When she was here, she made life miserable for everyone. Twenty years later, Abby thinks that Savannah might have changed, but the rest of the town isn't ready to forgive. When Savannah wins the first night of the contest, Evie Rice is furious. The two women used to fight over everything in high school, and neither is quite ready to let the old rivalry go. The next morning, however, Savannah disappears. After a day of searching, Abby finds her body. The list of suspects is long, including the obvious like Evie and Savannah's sister, who is hardly upset at her sibling's death. Also on the suspect list is Abby's cousin Karen. Karen has been acting rather strange since Savannah showed up the first night and the evidence seems to keep pointing to her. While Abby had no intention of getting involved, she quickly determines that she will have to find the real killer to keep her cousin out of jail. Abby's resolve is only reinforced when the case takes a very personal turn. Meanwhile, tensions in the family are brewing over Divinity. Abby inherited the shop from her aunt, and some of the cousins think they had more of a right to own the shop. Can Abby keep the peace and the store? This review has been hidden because it contains spoilers. To view it, click here. Blackmail, deceit, poisoned candy and a hit and run Oohh My!!! I liked this book alot. It was an enjoyable read and I liked the way the murder was conducted, it was a well thought out process. The killer was a bit cliche, however I did like the underlying true identity to the murderer's character. I also liked how "Karen" the cousin to "Abby" got her turn in the hot seat for a while during this book. I'm not sure what it is about her, but she gets under my skin a little, so seeing her in some ho Blackmail, deceit, poisoned candy and a hit and run Oohh My!!! I felt there was a few unnecessary side plots though that deviated from the track of the book. For example when "Abby's" niece gets her tongue pierced and "Abby" has to go with "Dana" to tell her father what she did. Did we really need a whole chapter to tie family drama together? I did like how the last few chapters really had me on the edge and wanting to race to the end, espeically after chapter twenty. The dramatic ending was also very well played out. So far I find this book has the best ending in the series. It's very suspenseful and adventurous. I am enjoying this series set in Colorado and a candy store. Savannah has returned to Paradise to help her sister settle their mother's estate. She is married to an up and coming guy who has just accepted a new job in New York. Everyone remembers Savannah from school and the feelings of hate are still rampant. Evie accuses Savannah of cheating during the Confectionary Competition when she wins first prize. Abby tries to smooth things over but makes little progress. Abby finds Savannah's body behi I am enjoying this series set in Colorado and a candy store. In Book two of the series, Abby is hosting the yearly 3 day Confectionary Competition. Her hopes for a smooth going are ruined when the much hated Savannah Horne shows up and wins the first night of the tasting. Savannah hasn't been in town for 20 years, but when she lived there, she hurt almost everyone in some way, so when she ends up dead, there are plenty of suspects. When Abby's cousin, Karen is a suspect, she can't leave the sleuthing to the police alone, and goes in search of the real kil In Book two of the series, Abby is hosting the yearly 3 day Confectionary Competition. Her hopes for a smooth going are ruined when the much hated Savannah Horne shows up and wins the first night of the tasting. Savannah hasn't been in town for 20 years, but when she lived there, she hurt almost everyone in some way, so when she ends up dead, there are plenty of suspects. When Abby's cousin, Karen is a suspect, she can't leave the sleuthing to the police alone, and goes in search of the real killer, putting herself in danger. I liked this cozy. Sammi Carter has a dry sense of humor that shines through this book. There were suspect aplenty but I did guess the murderer fairly early. There were great recipes in the back of the book but I would have liked more glimpses into chocolate candy making. I loved the main character, Abby Shaw. When questioned why she would give up being a corporate attorney to run a candy shop, I loved her answer. You will need to read the book to find out what her retort was. There seemed a litt I liked this cozy. Sammi Carter has a dry sense of humor that shines through this book. There were suspect aplenty but I did guess the murderer fairly early. There were great recipes in the back of the book but I would have liked more glimpses into chocolate candy making. I loved the main character, Abby Shaw. When questioned why she would give up being a corporate attorney to run a candy shop, I loved her answer. You will need to read the book to find out what her retort was. There seemed a little too many suspects but that's OK. I liked this second entry in the Candy Shop Mystery series. I've read the first one and found Abby, the protagonist, likable and believable as far as characters go. She doesn't do stupid things and she thinks logically. Set against the backdrop of a candy store is interesting; recipes for candies mentioned in the book are provided at the end of the book. Would I seek out other books in this series? I liked this second installment a little less than I did the first. I felt like the story surrounding Savannah was a little too complicated. I know we are supposed to be guessing who the murderer was, but it was like the author was trying really hard to lead us on a confusing wild goose chase. Also when you find out who the murder is it is kind of anticlimactic because supposedly Savannah uncovered all these lies.....but then none of those lies were told to the reader. 2nd in the candy shop series...better than the first, although I didn't like the end. How dumb can one chick be to go after a murderer? I know its a small town but are cops that clueless not to check into what someone reports, especially since it involved a death they are investigating?? I do like the slight romantic aspect between the main character and the cop, Jawarski. Looking forward to it developing in future books. A cute, cozy mystery set for the most part in a candy shop. The owner, Abby Shaw, continues her aunt's tradition of hosting a candy-making competition. When a former classmate returns to town and takes first place during the first night of competition, many people are very displeased, and someone is displeased enough to commit murder. Delicious candy recipes are also included. Yep, I didn't like this one much better then the first one. There is just something about the main character that drives me nuts! One thing I do like is that her dating the detective is more realistic than most stories I've read. That is about all I like about this series. I do not plan to read anymore! Abby is running her first Confectionary Competition. It's a struggle even before Savannah returns to town and is murdered. Again, the pacing wasn't quite what it could have been, but I love the characters. I liked this one better than the first one. I think the characters were more developed, and I never would have guessed who the killer was- well at least not until Abby found out who the killer was..on to the next book! I read Choco. Dip. Death at the end of 5th grade. It was around testing and it filled my time. It was just as good as the first but the trill of read it was more... locked up due to over excitement the first day of finding it. I really got into the story line and characters, interesting to read! Loved it. Looking forward to the other titles in the series. These are fun books with good recipes. Second in a series about Abby who comes back to her small town after the death of her aunt to run a candy shop. I liked this better than the first one in the series. This book is more action packed. Interesting how Abby's family seem to be suspects! Having trouble finding "Peppermint Twisted"
Sending this as a rabck to CdnBlueRose. Cozy mystery series set in a candy shop inherited by the heroine, Abby Shaw. 2nd in the Candy Shop Mystery series. Includes recipes. dis a a so-called good book it was ok,.! Sammi Carter is the multi-published, award-winning author of the popular Candy Shop mystery series featuring amateur sleuth Abby Shaw. Sammi Carter is the pseudonym of Sherry Lewis.